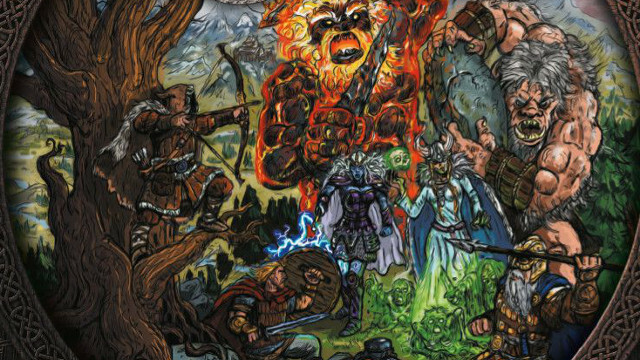 Our game of Nine Worlds has stalled, my troops are scattered to Midgard, Alfheim and Norheim, their grasp on these realms would seem strong but in reality it is tenuous at best, because it is no longer my go and now I must wait. Tick follows tock, as my opponent's later on in the turn order mull over every option available, consider every possible avenue for points, and weigh up every possible combination of actions available to them with their limited resources. Time itself has slowed to a stop. I can do nothing, only wait and see what my fate becomes. And thus Nine Worlds has committed a cardinal sin of modern board games, for I am now bored and I might as well play on my phone, go to the toilet or start peeling the spuds for the Sunday roast. I currently have no viable input into the game, until it all comes back round to me again. It's a game beautiful in both its presentation and in its simplicity. Although there are many options available each turn, these options are based on a solid foundation of straightforward mechanics, and are all about getting your tokens into the right place. At the end of every round a fight kicks off in any world containing more than five counters, with casualties being sent to Valhalla in turn order. Again, Nine World's simplicity shines through; combat is easy to determine, takes seconds to resolve and the results are thoroughly predictable, allowing players to be precise with their strategy. Once control of each realm has been determined those players in control of a world can use its special ability, giving them further options to fiddle with the locations of everyone's units. 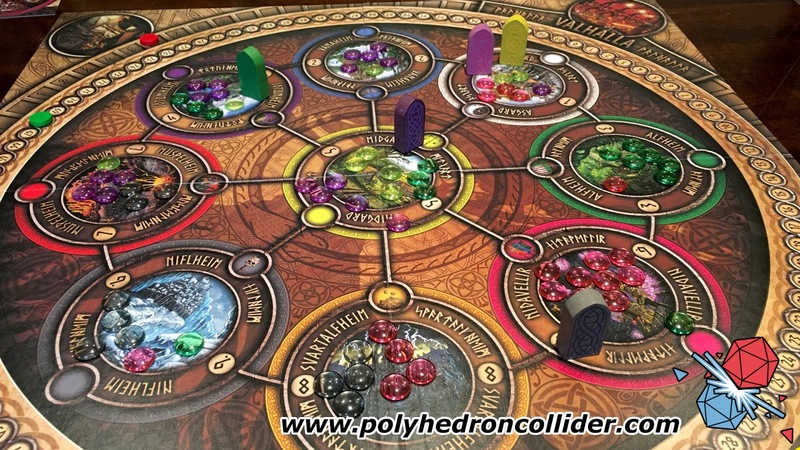 What is both interesting, and the main cause of my distress with Nine Worlds, is that scoring only occurs every three rounds (you can choose to play a short, standard or long game, of 3, 6 or 9 rounds respectively). This means that as you draw closer to that scoring round the dreaded analysis paralysis starts to weigh down the game like carbon monoxide poisoning. 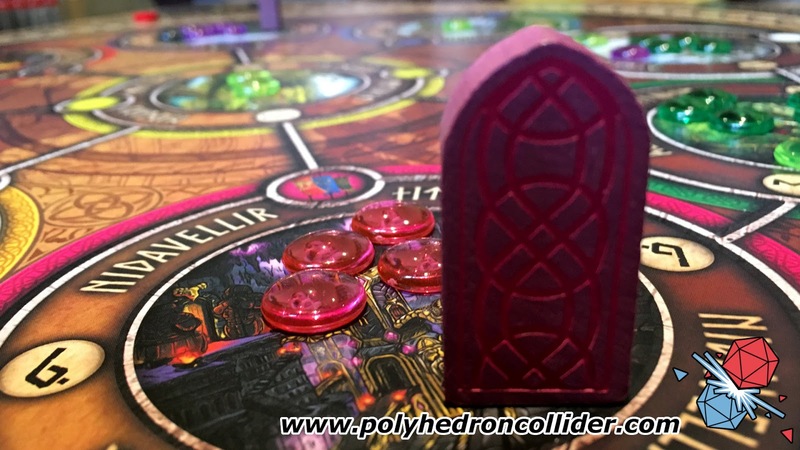 It is unfortunate, because it is here where the promise of Nine Worlds' simplicity gets stuck in a bog of options and, because each player takes their entire turn before moving to the next, there's more downtime than a kindergarten nap session. This downtime might not have been so bad if there was the option to formulate your strategy between turns, but the board state can change so drastically between players' actions that there's no real advantage to keeping your eye on what's going on. By the time play returns to you everything could have changed. This also results in a weird disparity with player count. With fewer players the game moves smoother and quicker but players are so spread out that combat rarely happens and there aren't as many interesting decisions to make. 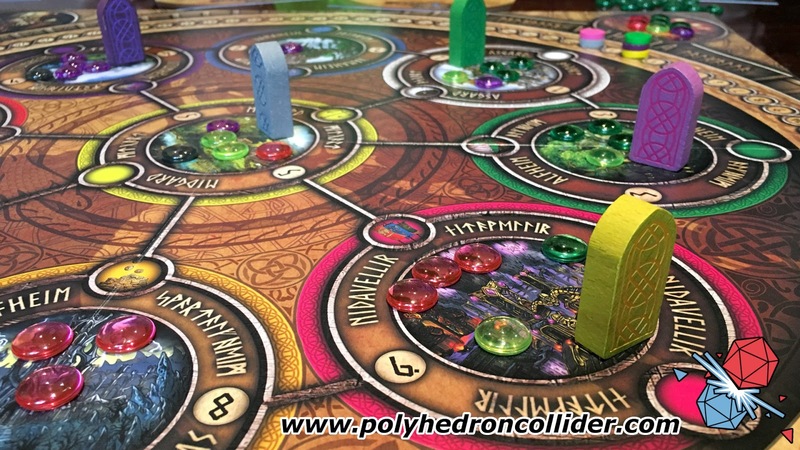 With more players you get stuck into the action quickly and the competition for space is immediate, but the resultant down time makes the game slow and tedious. On the surface it’s a simple game, but with a real depth of tactical options. It's just a shame that for the majority of the game you don't have any input and can't plan ahead, scheme or otherwise make decisions. Instead you'll be checking up on Facebook or discussing last night's Game of Thrones with your opponents. There's also another issue that makes the game a bit of a minefield for the majority of players and borderline unplayable for anyone with colour-blindness. 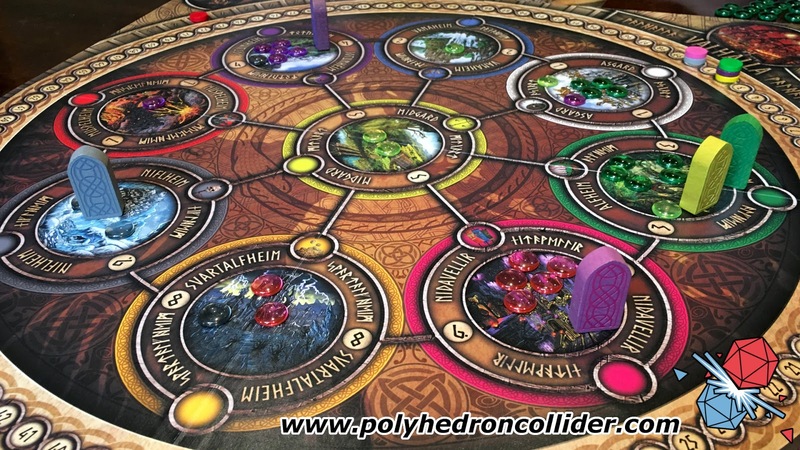 Because each of the nine Worlds represents a playable faction, there is nine different coloured pieces in the game. This inevitably leads to some player colours being a bit too close on the colour-blindness spectrum, but rather than helping through use of icons, Nine Worlds makes matters worse by using glass beads. The transparency of the glass means that the colour of the bead will look different depending on where it is on the board, which means that even those of us who have absolutely no issues with colour-blindness were still struggling to determine the colour of some beads. At first I was a stalwart defender of Nine Worlds. The action point system is both simple and deep, and the game has the potential to move along at a brisk pace. However, the myriad of options available each turn and the way in which turns are activated means that every time I have played Nine Worlds it has moved slower than a glacier in Jortenheim.